Productive work at the office and outside. Informative Leisure. In the recent past mobile phones were used for phone calls and messages only. Nowadays they were transformed into smartphones - powerful portable devices, which are able to solve many complex tasks. Many smartphone users join the network groups for a purpose of work or entertainment. For business customers, it is often necessary to sync their mobile devices with desktop computers at the office or with other mobile devices. That is the reality. At the office employees usually work with powerful desktop computers or laptops in order to process data or create reports. However, many employees also work outside the office on business trips or at the remote offices. Apple iPhone is one of the most popular smartphones in the world. It is widely used in a corporate environment because of its powerful features. 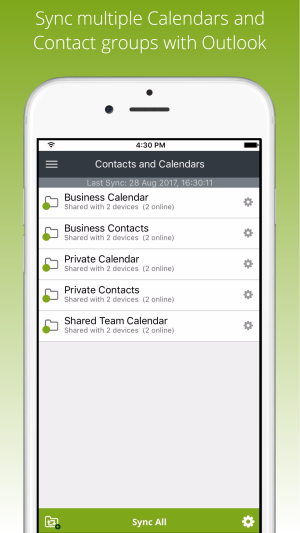 Our app SYNCING.NET for iOS Free Edition gives you a free sync for iOS and allows you to share documents or to sync personal data like contacts or calendars on your iPhone or iPad with your desktop computers or other mobile devices. Thus, with SYNCING.NET you can always be in sync with your office and access your data anywhere and at any time. Many companies use Microsoft Outlook on their desktop computers at the office. Many customers think of Outlook as an email manager. However, Outlook is a much more powerful program, which is able to store thousands of contacts in its address books, has a convenient calendar, allows you to create notes, control tasks and many more. Outlook also supports multiple accounts and allows you to archive your data. The SYNCING.NET for iOS Free Edition is a perfect iPhone sync freeware and offers a free Outlook and File synchronization for iPhone/iPad without cloud and makes life easier not only for remote employees. SYNCING.NET can be perfectly used for those who work at home and at the office. All documents are transferred across the desktop and mobile devices automatically. You don’t need to copy files manually anymore. For example, this feature can be very useful for accountants, engineers, or other customers, who work with many documents on multiple desktop or mobile devices. SYNCING.NET can help you significantly save time in this matter. SYNCING.NET iPhone sync software free download is available on the App Store. SYNCING.NET can be used not only by corporate customers, but also by private persons. SYNCING.NET is your sync freeware for iOS #1. SYNCING.NET has a unique synchronization platforms, which allows you to sync data across diverse desktop or mobile devices. For example, with SYNCING.NET it is easy to share documents, photos, video, music between iPhone and Android devices, sync iPhone to computer with Windows or Mac, sync iTunes to Android for free, share Outlook calendar without exchange, etc. All data exchange is done in enclosed user groups. You don’t need additional software or apps like iTunes for that purpose. SYNCING.NET makes it possible in one app for each platform. We constantly work on the new exiting features of the SYNCING.NET for iOS Free Edition. Already now the app allows you to share documents and personal data like contacts or calendars between different devices, such as iPhone/iPad, Android and Windows smartphones and tablets, desktop computers running on Windows, macOS or Linux. Please visit our website or contact us for more information. Works in a cloudless environment and does not require additional servers. All your data is stored locally and highly protected thanks to the multi-level encryption. Seamless and safe cross-platform synchronization between desktop computers and mobile devices. Free data synchronization with up to 2 GB. The SYNCING.NET app for iOS Free Edition is an iPhone sync freeware. You can download it on the App Store. If you installed the app on your device and have any questions, please contact our technical support. We offer free support by email. We will be glad to help you with your requests regarding the app. If you need more features like unlimited data traffic or a collaboration with other SYNCING.NET users you can purchase a paid version in the online shop or right from the app at any time.